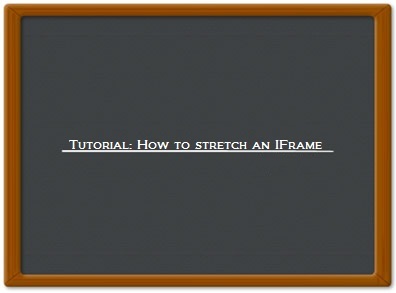 Ever wonder how to create an iframe that fills the entire height (and width) of a page? and expected the iframe to fill up whatever it could. The width=100% does what you expected and fills up the entire width of the page, but the height just stays about 200px. The problem is that the IFrame is not a block element so its hight is fixed to about 200px unless you set the hight to exact size, e.g. : 550px but in most cases this won’t solve the problem I’ve described earlier. There are many solutions of the problem some works well some don’t. For example there is a pure CSS solution that will fix it. You’re more than welcome to share your thoughts on the previous solutions. If you stumbled on another one that hasn’t been mentioned here I’d like to see it and implement it in real world scenario so feel free to post a comment. Source Code -> Iframe with 100% Height | Yin Yang Source. And I do have 2 questions for you if it’s allright. Is it only me or does it seem like some of the comments look as if they are written by brain dead people? 😛 And, if you are writing at other social sites, I would like to keep up with anything new you have to post. Could you make a list of all of your social pages like your Facebook page, twitter feed, or linkedin profile? This code helped me so much thank you! Saved me alot of headache!